“All’s Well That Ends Wells” is one of the best productions of Shakespeare at the Festival Theatre in the past ten years. Director Richard Monette has thrown away the various distracting directorial crutches he has used for far too long and used the text alone for support. The result is the clearest, most involving Shakespeare play he has directed for some time. This is fortunate, since the play itself is one of Shakespeare’s most difficult comedies. By emphasizing key passages in the text and the important parallels in the between the various plots, Monette smoothes away the play’s difficulties and will may one wonder why such an intriguing work is not better known. “All’s Well” is often spoken of as one of Shakespeare’s “problem plays” along with “The Merchant of Venice” and “Measure for Measure”. All three have in common a happy ending enforced by law that not only does not resolve the problems the play has raised but, in the case of the last two, makes them worse. In “All’s Well” Helena, a poor physician’s daughter, rich in virtue and wisdom, falls in love with Bertram, a young nobleman devoid of both. He has the title of nobility, she its qualities. What is so perplexing is that Helena goes to such great lengths to pursue and win Bertram as a husband even though he spurns her and everyone in the plays, including Bertram own mother and the King of France, think Bertram too far below her. To compound the problem Shakespeare shows Bertram as immature and untrustworthy right into the play’s final scene, giving him only a handful of lines to suggest in the play’s final moments that he has made a complete about face in his attitude toward Helena. Monette solves these problems by emphasizing the parallels between the main plots and the subplots. In Helena’s view “Our remedies oft in ourselves do lie, Which we ascribe to heaven”. Helena pursues Bertram to the French court where the King lies ill. At the end of Act 1, Scene 1, before she even administers the medicine that will cure him, Monette has the King rise from his chair under Helena’s influence and walk again. In this simple, brilliant stroke, Monette underlines the truth of Helena’s statement and suggests that Helena’s semi-magical power includes the ability to see the good in people that they themselves may not recognize. If so then objections to her pursuit of Bertram fall away since she can see what he will become not just what he is. In the same way, Monette stages the exposure of Parolles’ falseness in Act 4 and Bertram ‘s in Act 5 in such similar ways the parallel is unavoidable. Parolles, a follower of Bertram, is Bertram’s Bad Angel, Falstaff in the form of a dandy. He persuades Bertram to leave his newly wedded but unloved wife Helena in France and go to Italy to fight in the wars. There Bertram’s company uses a trick to reveal Parolles as a faithless liar in war. In the next act Bertram is on the spot, literally, just as Parolles was as accusations fly and he is proved a faithless liar in love. The strengthening this parallel helps us believe that just as Parolles realizes his foolishness and receives mercy, so will Bertram. If there is any flaw in the direction it is in giving the same stately rhythm to every scene no matter where it is set or what its subject. The show is anchored by three superb performances that are reason alone to see the play. Lucy Peacock played Helena when Stratford last mounted “All’s Well” in 1988. This time she brings deeper emotion and greater understanding to the role. She shows us a woman who managed to hold on to faith in herself and in divine providence (“the time will bring on summer”) despite the odds against her. Domini Blythe brings out all the warmth and richness of the role of the Countess of Rossillion, Bertram’s mother with an ability to make clear some of Shakespeare’s most complex lines. William Hutt is wonderful as the King of France, marking such a distinction between the sickly and the healed king that the one seems to have arisen from the cocoon of the other. The actors in the other two major roles don’t bring as much out in their characters as they could. David Snelgrove is fine at portraying Bertram as a proud, callow youth and he makes his repentance in Act 5 seem sincere which is so crucial for Monette’s interpretation. It would good, however, if he could give us some glimmer of the good character Helena sees in him. Tim MacDonald plays Parolles solely as a buffoon which makes it difficult to see why Bertram should follow his advice. If he could make this braggart bolder and more obnoxious, then his humiliation would have greater weight. Lord Lafew is one of the characters Shakespeare uses to guide our moral judgment. Bernard Hopkins gives him both sternness and geniality and makes his taking pity on the humbled Parolles a key moment in understanding the play. 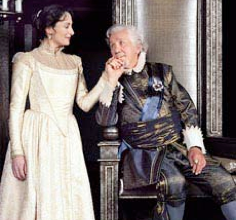 Benedict Campbell does not play the Countess’s fool Lavatch any differently than other comic characters of Shakespeare he’s played except that here is thankfully more restrained. Brian Tree is hilarious as the interpreter of the soldiers’ nonsense language to Parolles. The three Florentine women (Brigit Wilson, Sara Topham, Sarah McVie) when played as well as here give the play the right upswing in mood following the bitterness of the French scenes. Topham’s thoughtful performance as Diana immediately reminds us of a younger Helena and makes her agreement to the “bed trick” of Act 4 both more plausible and more ironic. In contrast, lack of clear diction prevents Evan Buliung and Roger Shank from giving the Dumaine brothers much character. Ann Curtis’s historically informed costumes with their colour linked to the moods of the characters are beautiful to behold. Kevin Fraser’s lighting also reinforces the changing moods of the play, his sudden fades to a pinspot suggesting the ever-present darkness that threatens to engulf the action. Such a thoughtful production on a nearly bare stage with the emphasis on drawing us into the action by Shakespeare’s words and the complex emotions they evoke reminded me of the kind of Shakespeare we used to see at Stratford in its heyday. It was encouraging that Monette could recapture that mode of presentation after so many years and thereby make a play as complex as “All’s Well” so clear. This production is far superior to last production Stratford did in 1988. I hope the Festival does not wait another 16 years for another “All’s Well”, but even so this one will be hard to beat. Photo: Lucy Peacock and William Hutt. ©2002 V. Tony Hauser.